So . 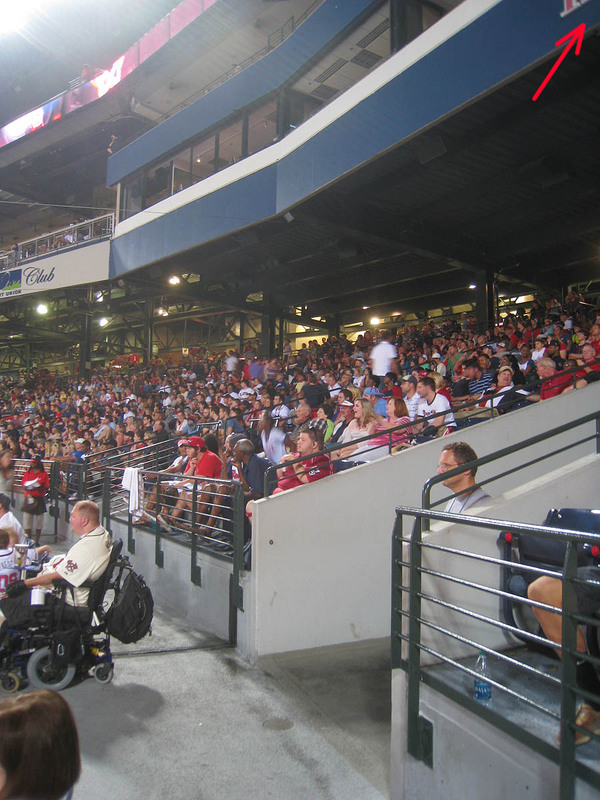 . . yeah, I went to Turner Field. I usually announce my trips far in advance, but this time I just didn’t feel like it. There was a VERY special baseball to be snagged, and quite frankly, I didn’t want to have a ton of competition. Forgive me. 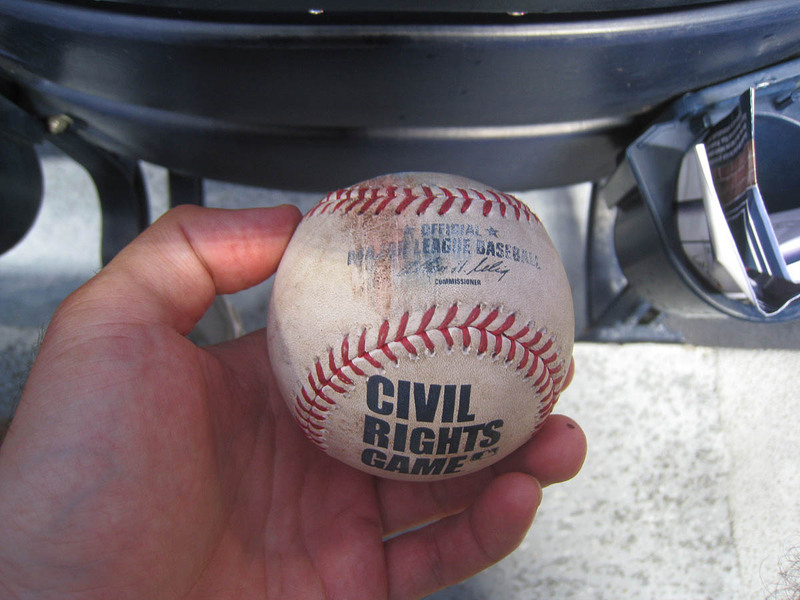 Since 2007, Major League Baseball has had an annual Civil Rights Game. 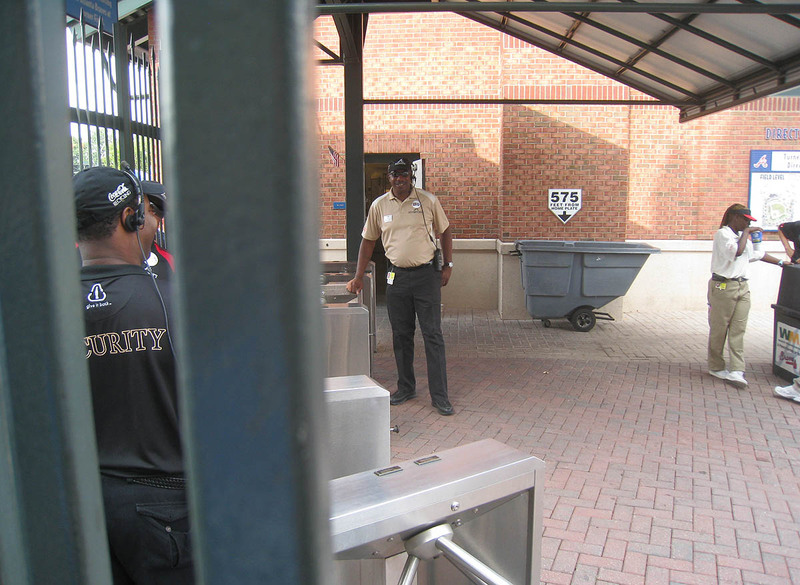 For the first two years, it was a pre-season affair that took place at AutoZone Park, and after that it became a regular-season event. 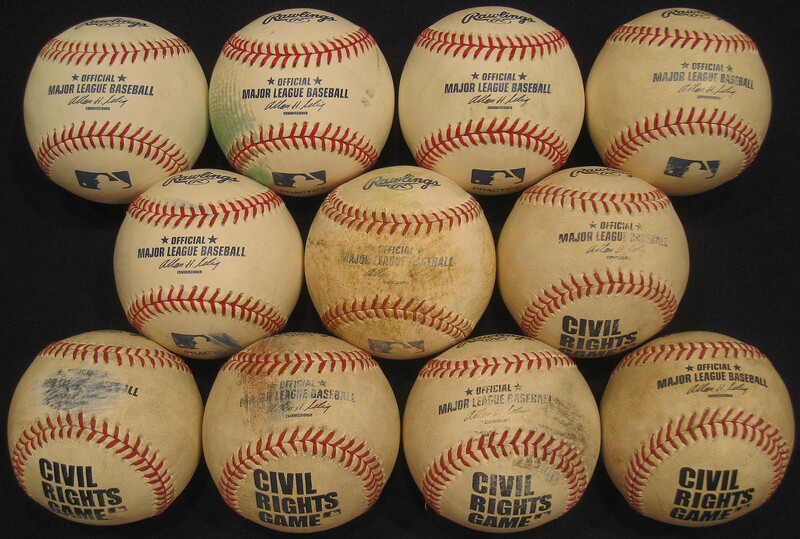 (I never knew about it until this season; the Civil Rights Game, evidently, doesn’t receive national publicity.) 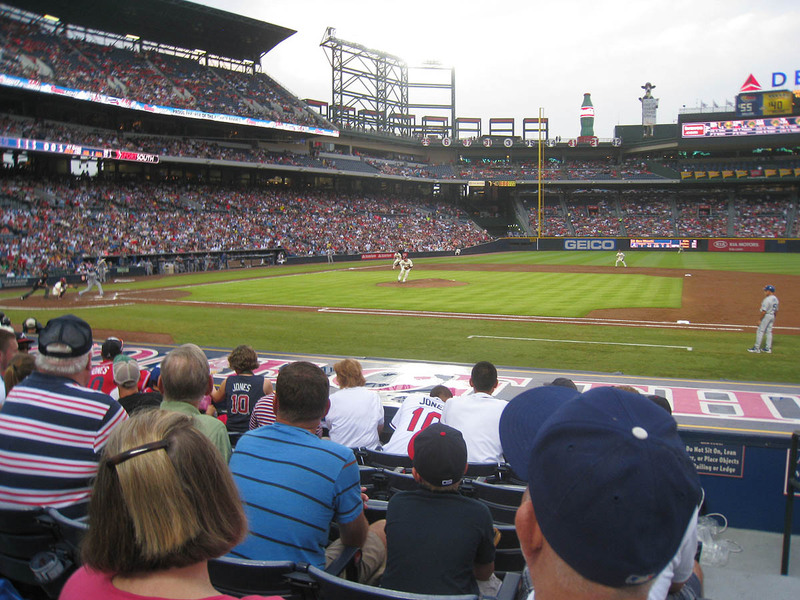 In 2009 and 2010, it was played at Great American Ball Park, and last year the game moved to Turner Field. This season it was back in Atlanta . . . and I’d heard that a special/commemorative ball was going to be used . . . so that’s why I made the trip. I was hoping that some of the special balls would find their way into the batting practice buckets, but no, this ball . . .
. . . and everything else that I snagged before the game had the standard MLB logo. 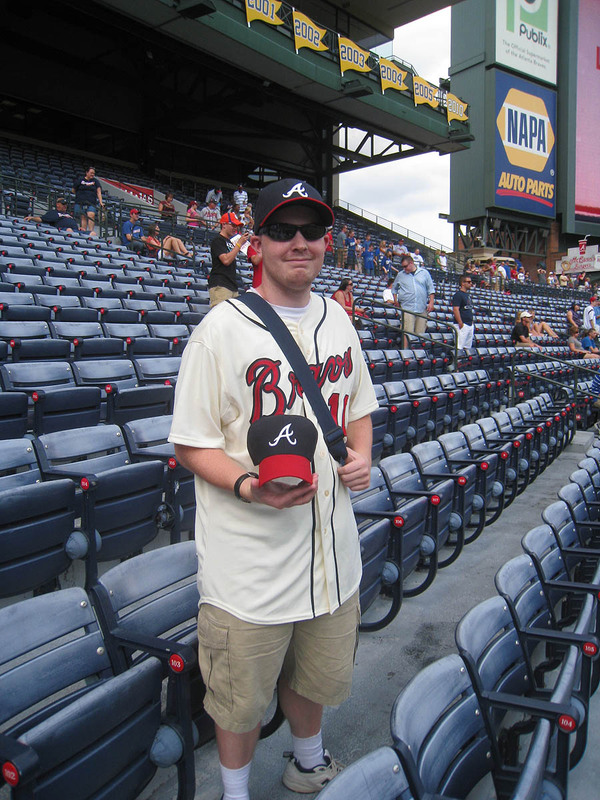 Matt is a regular at Turner Field and has become a good friend. 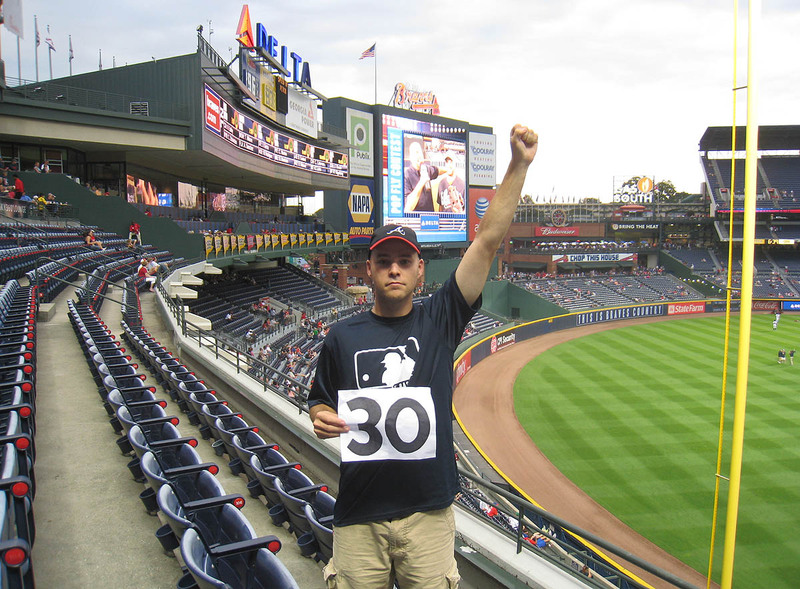 You might recall that on September 26, 2011, he was the one who took the final photo of me for my 30-stadium collage. Sweet! The ball was still there. 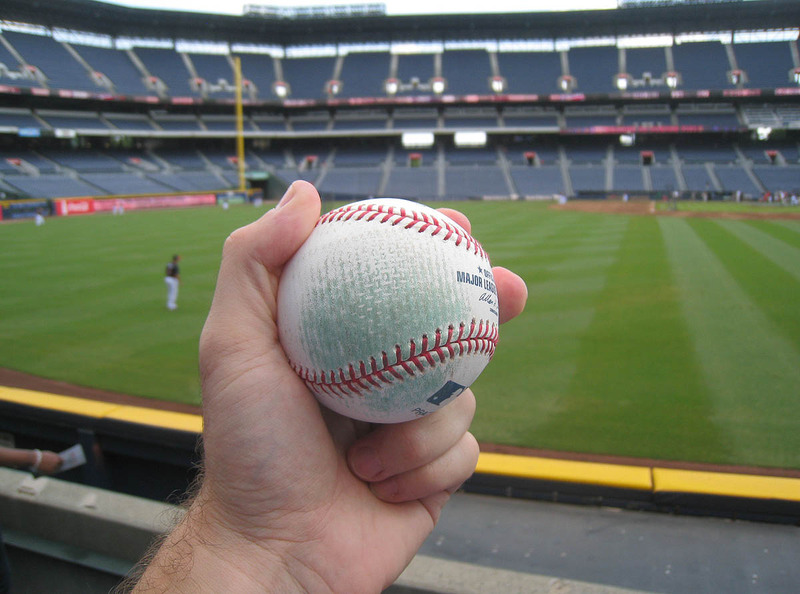 I used my glove trick to reel it in and was told by a nearby fan that it’d been thrown by Brian McCann. 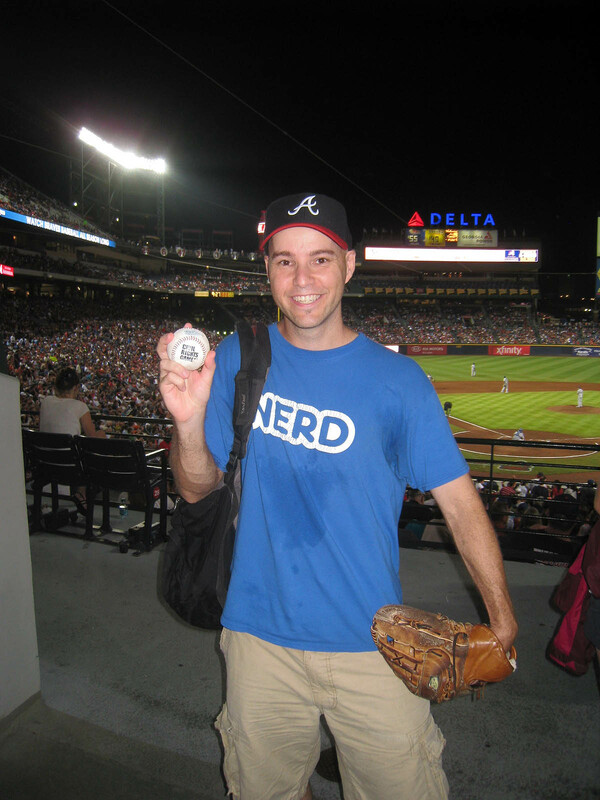 When the Dodgers started hitting at around 5pm, I ran back to left field and caught an A.J. Ellis homer on the fly. Then I used the glove trick to pluck two more balls from the gap, the second of which I handed to the nearest/smallest/glove-wearing kid. Toward the end of the Dodgers’ portion of BP (which ended half an hour early at 5:45pm), I ran back to right-center and snagged two more balls. The first was a home run that bounced off the padding atop the outfield wall and plopped into the gap. The second was a towering homer by James Loney that I caught on the fly in the 7th row. I was in the 6th row when the ball was hit, but because I’d been looking elsewhere, I didn’t see it until it was at the top of its arc. I quickly determined that (in addition to landing 20 feet to my right) it was going to sail a bit too far, so I climbed back over a row and reached high over my head for a back-handed grab. In case you can’t tell, two coaches were transferring all the balls from the basket to an equipment bag. I ended up getting a ball from one of them, and I have no idea who he was. I think the back of his jersey said “MC CULLUM 89.” Look closely above the Red Sox cap two photos above and you’ll see him. Does anyone know who that is? 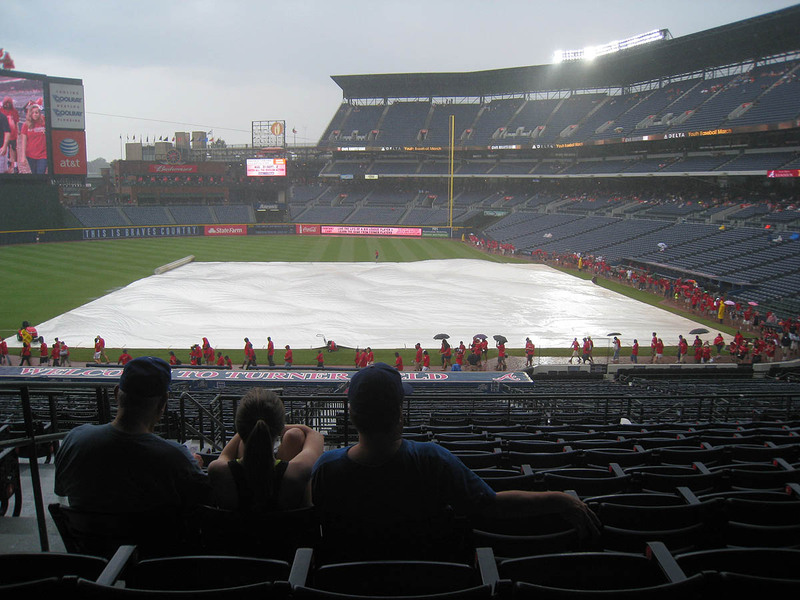 It was pouring, but that didn’t stop the red-shirted fans (whoever they were) from walking slowly around the warning track. The forecast hadn’t called for rain. Few of them had umbrellas. I found it amusing. When the game started, I decided to go all out and try to milk every possible opportunity for a ball. 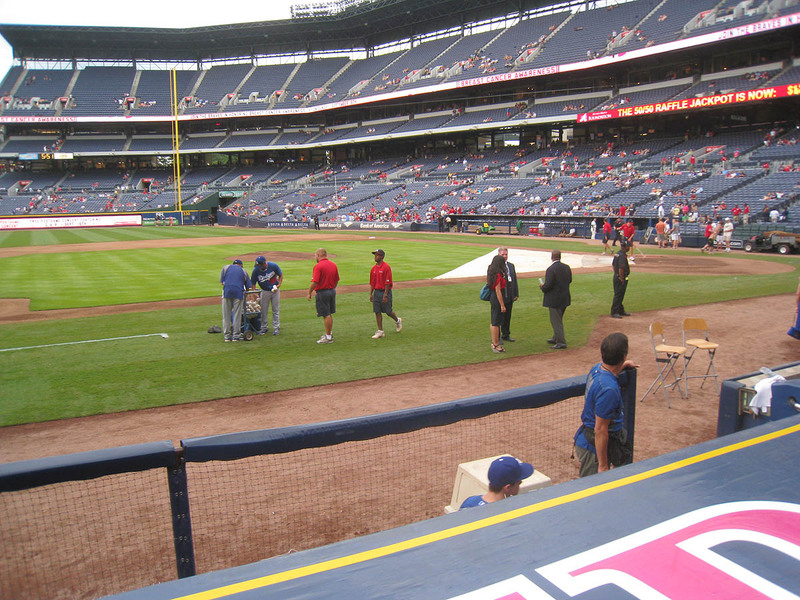 My plan was to go for foul balls in the tunnels and cross-aisle behind home plate . . . and also to play both dugouts for 3rd-out balls . . . and if all else failed, I figured I’d have a shot after the game with home plate umpire Mike Winters. I was truly thrilled at that moment. Mission accomplished. Goal fulfilled. Dreams realized. Okay, I’m getting carried away, but seriously, I was pretty much ecstatic. I went back to the Dodgers’ dugout in the bottom of the 2nd, and when Michael Bourn went down swinging to end the frame, I figured I had no chance to get the ball. I was sitting behind the outfield end of the dugout, but catcher A.J. Ellis was going to enter the home-plate end. Short story short: I got him to throw the ball to me from about 75 feet away. It was truly a thing of beauty. Now, as you might expect, the people sitting around me weren’t exactly delighted by the fact that I’d gotten two baseballs in two consecutive innings, but they all ended up loving me. Why? Because I pulled a (batting practice) ball out of my backpack and handed it to the nearest kid. And I wasn’t done. I noticed another kid sitting nearby, so I grabbed another and hooked him up too. 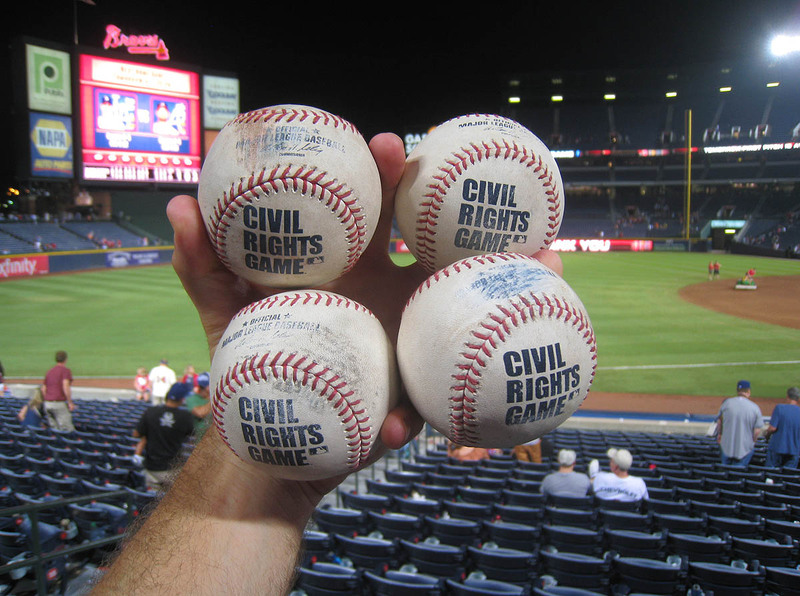 In case you haven’t noticed, all three of my “Civil Rights Game” balls were somewhat flawed. The main part of the logos (where it says “official major league baseball”) was rubbed and scuffed, so yeah, I was still hoping to snag another. As you can see, there were kids standing at the bottom of the staircase, waiting for the 3rd out to be recorded, and no one was stopping them. It’s hard to tell in the photo above, but THAT logo was messed up too. Hmph. 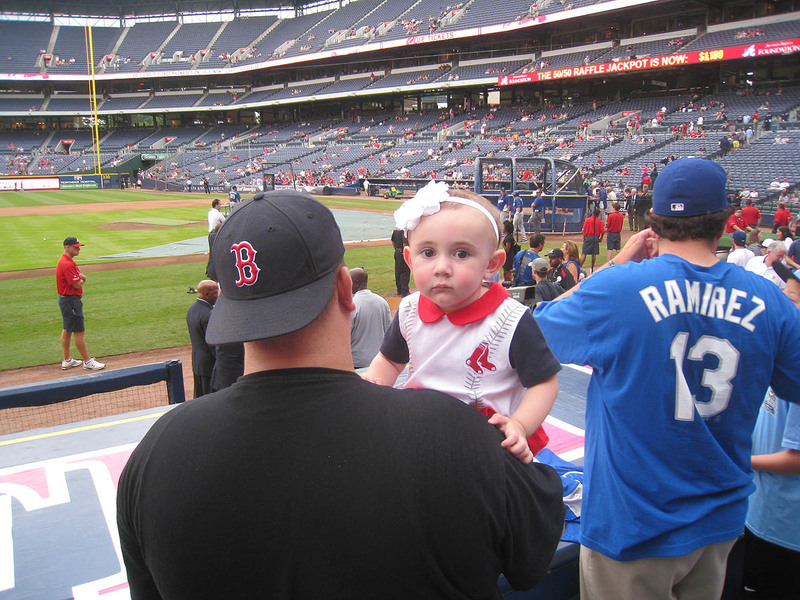 It was quite a night, and as the 9th inning rolled around, I had a chance to make it even better. I went down to the Dodgers’ dugout one final time . . . 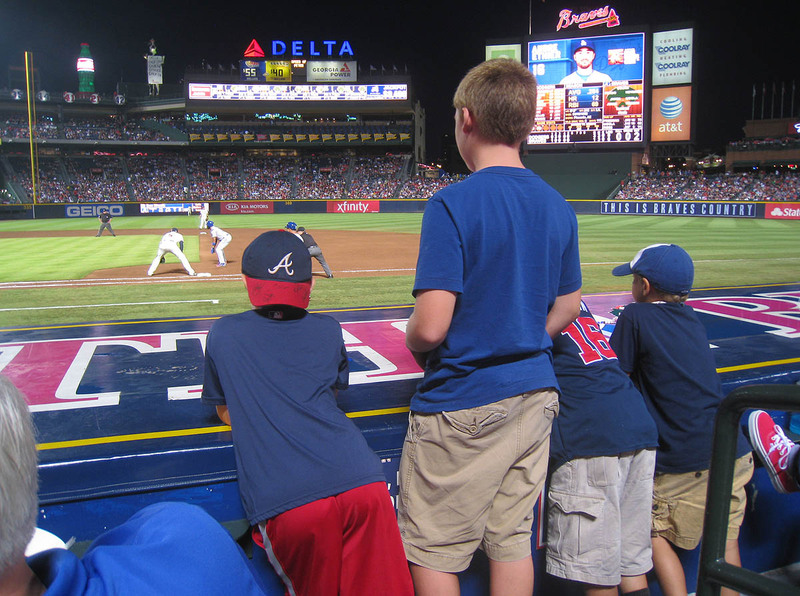 Final score: Dodgers 6, Braves 2. Oddly, there were nine total hits in the game — four by the Dodgers and five by the Braves — and ALL of them went for extra bases. All four of the Dodgers’ hits were home runs, while the Braves had three doubles, a triple, and a homer. As for the “Civil Rights” portion of the day . . . I don’t know what to say. Hank Aaron was there, along with several other baseball dignitaries and three of the original members of Earth, Wind & Fire. There was a smattering of pre-game activity (largely consisting of videos being played on the jumbotron), but it wasn’t extravagant like the kind of stuff I’ve grown accustomed to seeing at All-Star Games and the World Series. There wasn’t a flag that covered the entire outfield. There wasn’t a military jet flyover. And you know what? That’s good. 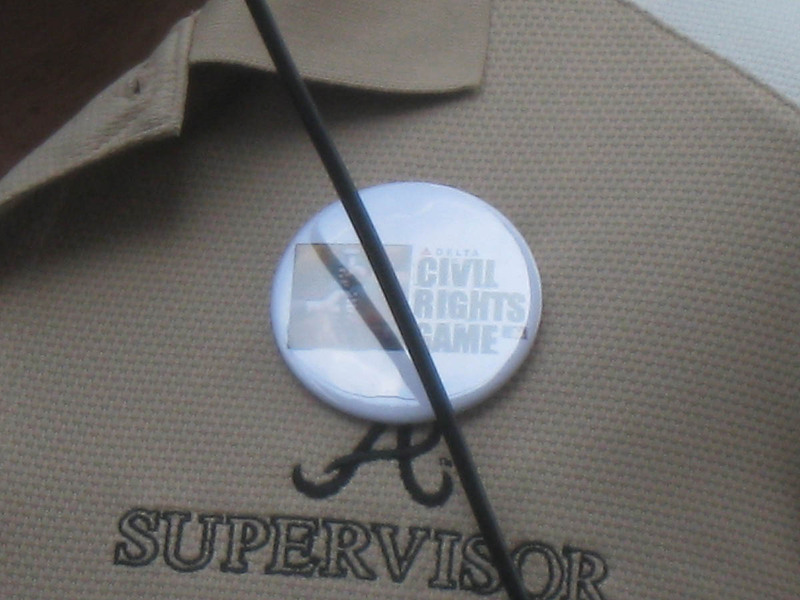 I tend to think that “less is more.” I just wish that more people knew about the Civil Rights Game because it obviously supports a great cause and has a positive message. Matt was standing nearby and offered to take a photo of me so that I could hold up all five. Here is it . . .
. . . and for the record, I had no idea that Andrew was lurking/pouting in the background until later. 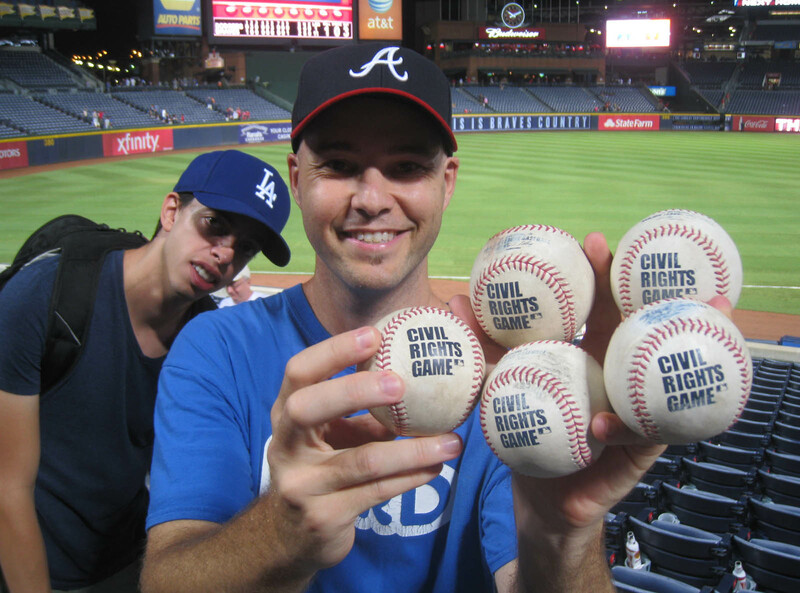 Andrew did snag one ball during the game, but it was a regular/practice ball that got tossed up from the Dodgers’ dugout. Matt and I got a photo together . . .
. . . and then we all headed out. What an awesome day. Here’s a pic of the 11 balls that I kept . . .
• 440 balls in 54 games this season = 8.15 balls per game. 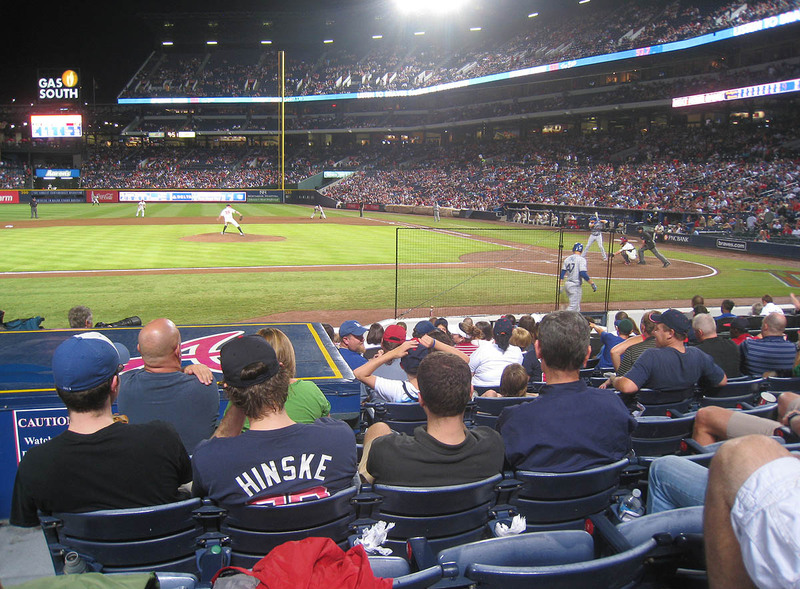 • 158 balls in 11 lifetime games at Turner Field = 14.36 balls per game. 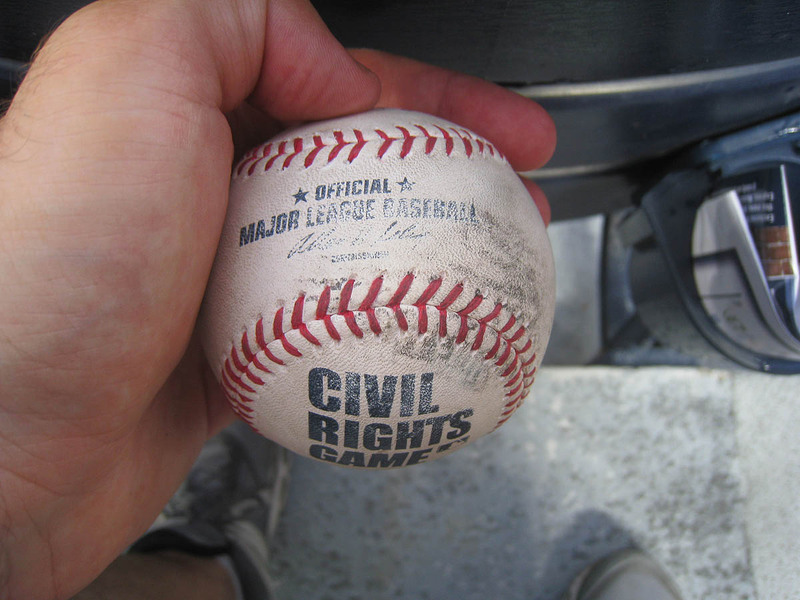 August 20, 2012 - 3:34 am Leigh B.
We’ll never have a civil rights game at PETCO Park. They really should rotate it around. I wonder if that big logo had something to do with all those extra base hits. Easier for the batters to pick up movement? Awesome. Truly awesome. You still find ways to amaze me! Hooray for spur of the moment trips. Those 5 Commemoratives most likely made for a pleasant flight home. Ben- When he e-mailed me, the jersey was one of my first thoughts. That’s a huge logo. I’d love to play a game with that ball. Good game. Great entry! I enjoyed the “secret photos”, and the way you introduced the friends you invited, reminded me of Gandalf introducing the Dwarves to Beren in “The Hobbit”. I noticed you forgot to close the parenthesis in the text between the photos of the first two CRG balls you collected. Nice! I have to share a story from my game on Saturday. 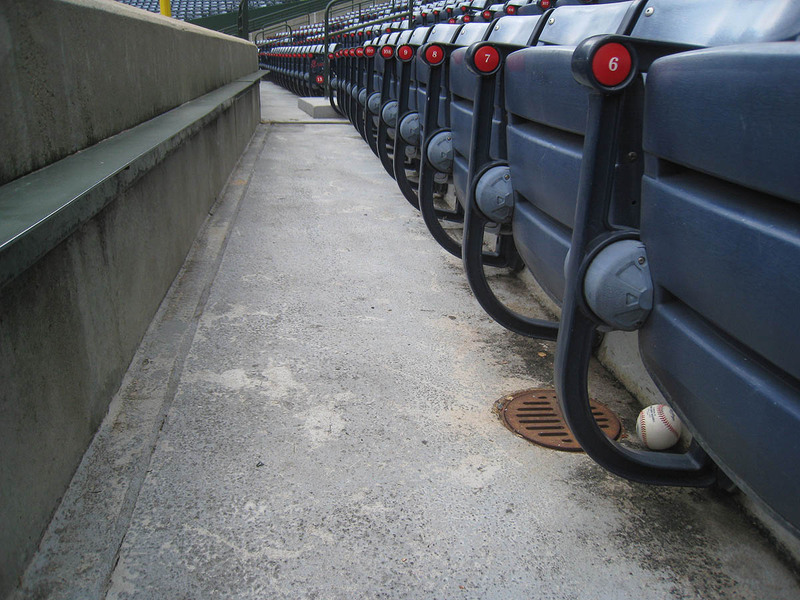 1st, I actually found an easter egg in the bleachers. 2, check out this video. http://www.youtube.com/watch?v=eXo-eathEgESome guy was heckling Chris Perez from the bleachers, and came over to the foul pole to talk to him. His buddy filmed the entire thing. 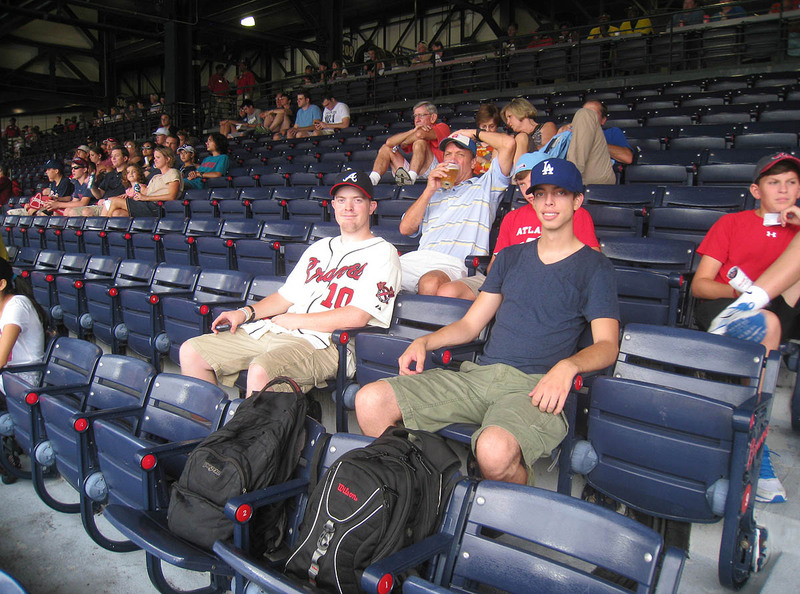 3rd, some guy slammed me into the side of a tunnel in the bleachers when we were chasing a BP home run. 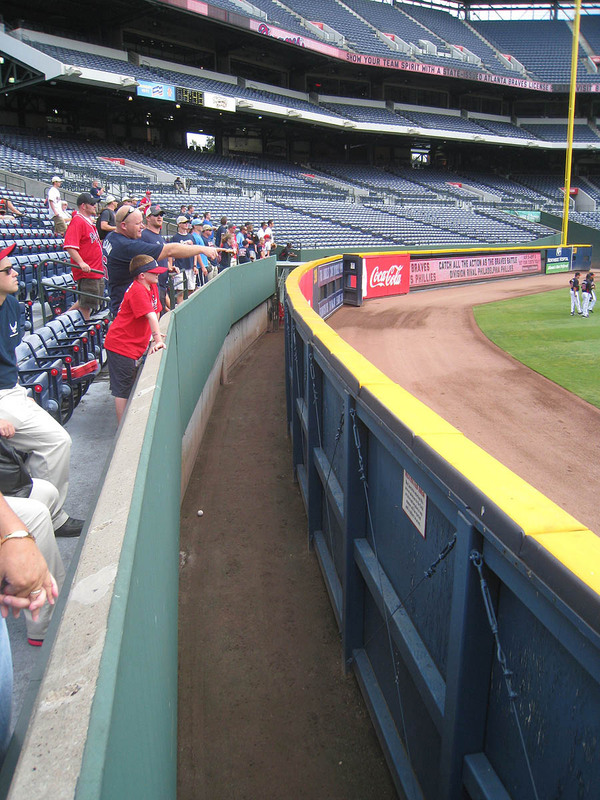 Last, there were two foul liners hit into the seats down the RF line during BP. The first one hit the steps, and started trickling down under seats. I went for it, and was pushed out of the way by someone. I ended up doing some pakcour over the seats, and somehow managed to stay on my feet. A few minutes later, a ball was hit in the same place. It landed 10 feet behind me, and I ran to grab it. Some guy pushed me over (On the metal part of the steps) and LAID ON TOP OF ME while he grabbed the ball. I was suffocating under a 300 pound + man with sharp elbows. It was awful. All of a sudden, BP ended. I rolled out from under him and ran towards the Indians dugout. I didn’t end up getting a ball there, but I did get a ball from the security guard who had witnessed both of the incidents. My left hand still hurts like crap, but I’m not too worried. If only they brought those on the road with them…Actually, we’ll see. Zack, if you listened carefully, you would have heard me swearing up here in Massachusetts about.. Ok I was working on my dining room table and had no idea you were in Atlanta. To be able to run off, oh so cool. 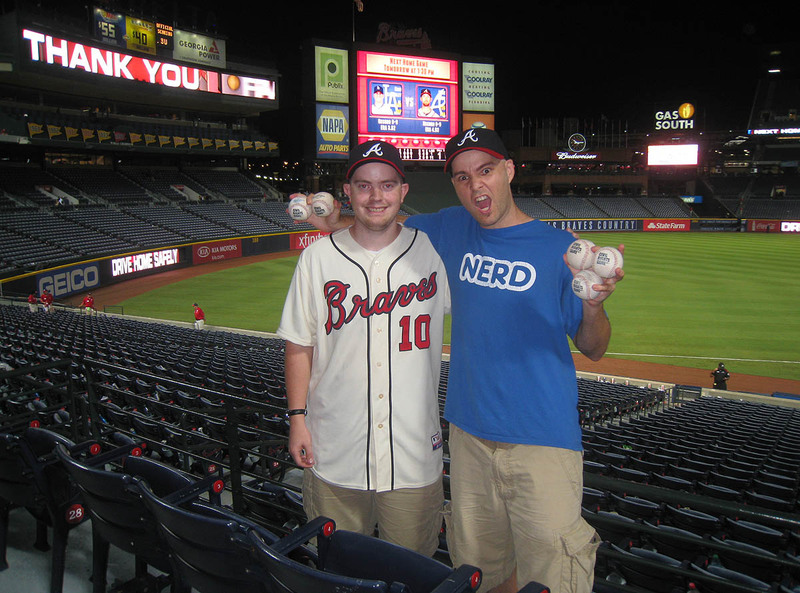 11 baseballs, ah to have a night like that. 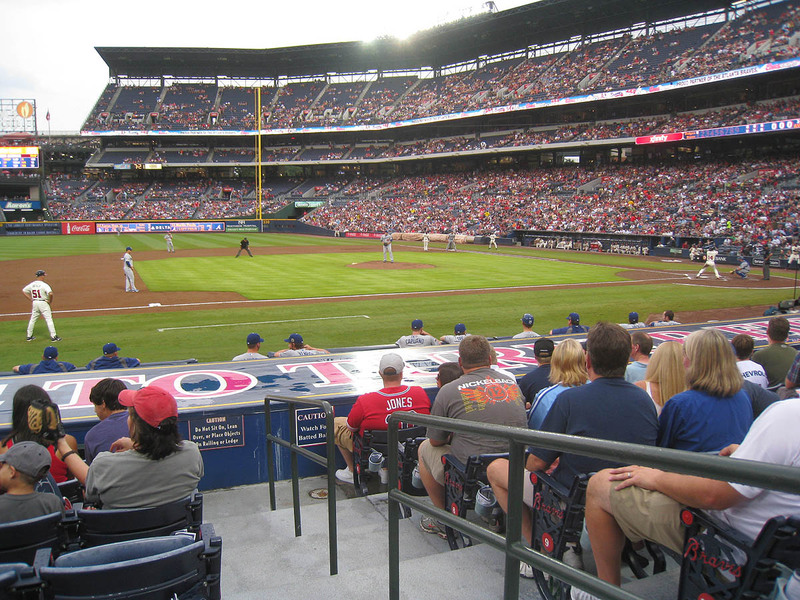 I love Turner Field! Friendly fans and staff. Mediocre food. (Some of my Mom’s ashes are spread there – Sssshhhhh!) They also have dollar tickets that go on sale 10 minutes before game time. Not the greatest seats, but you’re still at the ballgame. 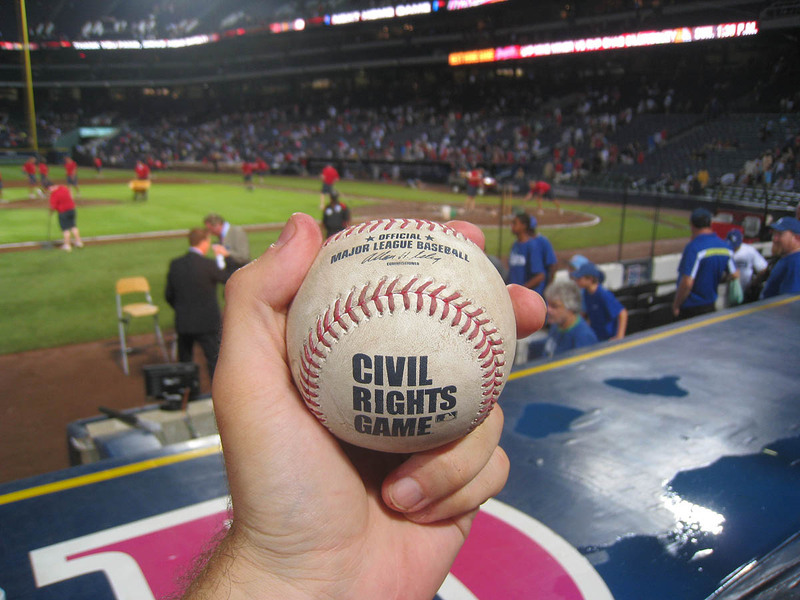 http://www.lavasurfer.com/info/mlb-cheapseats.html I didn’t know about the Civil Rights Game. Wish it were more advertised. Congrats on all the cool balls! Did anyone else watch the Olympics with baseball being taken out I was so mad I didn’t. I agree with Connor’s insight above. Big logo: easier to see the rotation.